In just a few short days, we’ll be stuffed to the gills and unable to even look at another bite of food. I know; I’ve been there. Many times, in fact. One of the great joys of Thanksgiving (besides the time spent with family and friends) is the food, especially the leftovers. This week’s #SundaySupper is all about making the most of your Thanksgiving leftovers, with dozens of recipes below ranging from breakfasts to desserts, and everything in between. My contribution makes good use of that leftover turkey. You see, in our family, the stuffing rarely makes it to day two, thanks to all night fridge raids. The mashed potatoes are a close second to disappear. Starchy sides go fast around here. Then there’s the turkey. Lots of turkey, oh-so-good in simple sandwiches of white bread, mayo, fresh cranberry sauce, and nothing else. Sure, I could graze on that for days, but eventually most of us want something that doesn’t have the same flavor profile as the Thanksgiving leftovers. That’s where these enchiladas come in. This is a completely new meal and one we enjoy here year round. Most often I make these enchiladas using one of those rotisserie chickens from the deli. But once I tried them with leftover turkey, there was no turning back. I imagine even leftover pork roast could be subbed in. Did you bake some sweet potatoes? Those could be chopped up and tossed in as well. The content of the filling is really up to you. Sometimes I add chopped onion, today I didn’t … they’re slightly different every time and always a crowd pleaser. Saveur’s Mexican Rice makes a perfect side, and for refried beans, try this: In a non-stick skillet, add one can S&W Pinquitos (with juice) and one can pinto beans drained. Heat over medium high heat, and mash with a potato masher, cooking until there’s no more liquid. Garnish with some crumbled Queso Fresco, and viola, easy homemade, fat-free refried beans. Are you hungry? Let’s begin. Why, yes, that IS a can of Las Palmas enchilada sauce … we’re going semi-homemade here today!Â Also note, I used La Tortilla Factory’s hand-made style tortillas as they’re thicker and hold up better than the thinner variety. 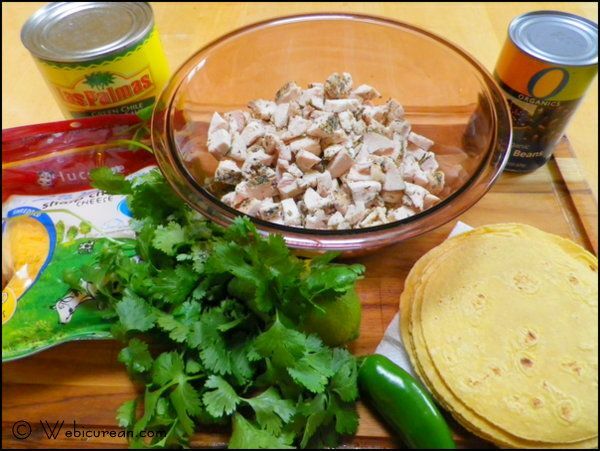 The ingredients can be tossed together in noÂ particular order.Â Usually I start with the turkey in a large bowl, then squeeze the lime juice over that and toss, then add the beans, the garlic, the pepper and cilantro. Then mix in the 1/2 cup cheese with a little salt and pepper. 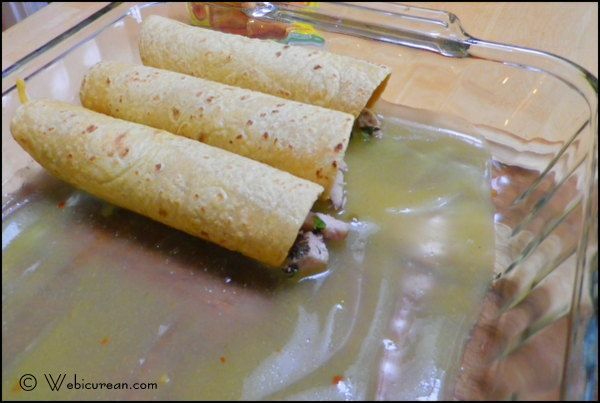 Before assembling,Â heat the tortillas for about a minute in the microwave (wrap in a damp paper towel).Â Spread about a half cup of sauce on the bottom of a 9×13 glass baking dish. On each tortilla, spread on a small amount of the sauce with a spoon (literally just to moisten). Cupping the tortilla in your hand (see above), spoon about 1/3 cup filling into the tortilla, fold both sides over, and place seam side down in the dish. Lining them up neatly in the dish, you should be able to easily fit one dozen. Once the dish is full, pour the remaining sauce over the top, then sprinkle with the remaining cup of shredded cheddar. Bake at 350F for about 30 minutes or until golden and bubbly. These enchiladas make great use of your leftover Thanksgiving turkey and are a perfect any time meal. 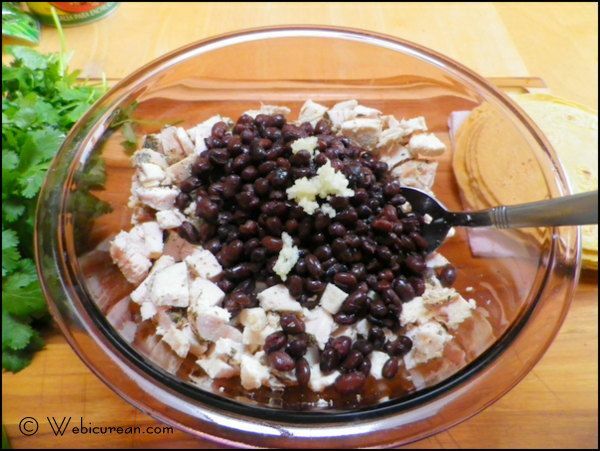 In a large bowl, mix together turkey, beans, garlic, cilantro, pepper, lime juice, and ½ cup cheese. Salt & Pepper to taste. 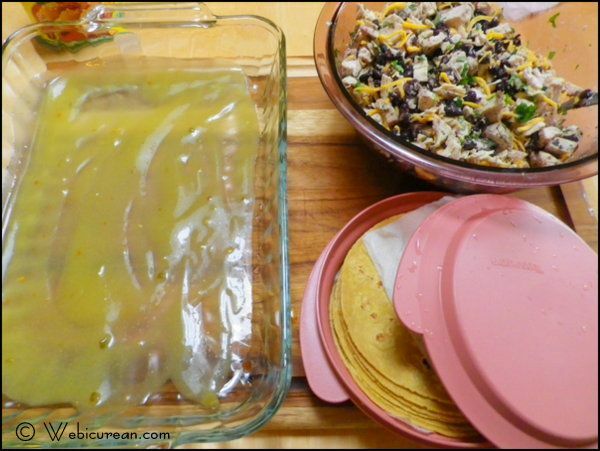 Spread about ½ cup enchilada sauce on the bottom of a 9x13 glass baking dish. Wrap the tortillas in a damp paper towel, and microwave for about one minute. To assemble the enchiladas, cup a tortilla in one hand, spread a small amount of sauce on the tortilla just to moisten. Spoon in ⅓ cup filling mixture, fold the sides over, then place seam side down in the baking dish. Repeat with each of the remaining tortillas. Pour remaining sauce evenly over the enchiladas, then top with the remaining shredded cheddar cheese. Bake for 30 minutes or until hot and bubbly. Need more ideas for your Thanksgiving leftovers? Check out the line-up below! Please join on us on Twitter throughout the day during #SundaySupper on November 18. Â In the evening we will meet at 7pm EST for our weekly #SundaySupper live chat. 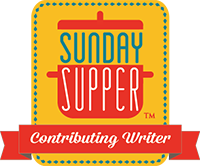 All you have to do is follow theÂ #SundaySupperÂ hashtag or you can follow us throughÂ TweetChat. Weâ€™d also love to feature your recipe for Thanksgiving Leftovers on ourÂ #SundaySupperÂ Pinterest boardÂ to share them with all of our followers, too. I absolutely love the challenge of finding a recipe that uses up leftovers that makes it a completely new dish and this one just made it to the top of my “to try” list. I love the idea of turning Thanksgiving leftovers into a Mexican dish. What a great idea for Thanksgiving leftovers. 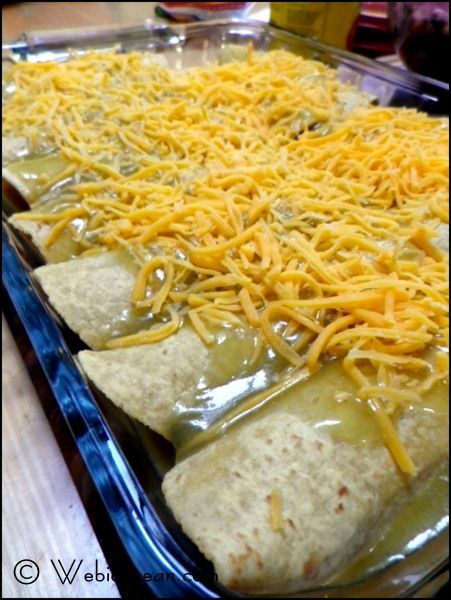 These enchiladas look amazing! Generally this is what I do with leftovers. I will next time add the blackbeans. Turkey sounds great instead of beef or chicken! 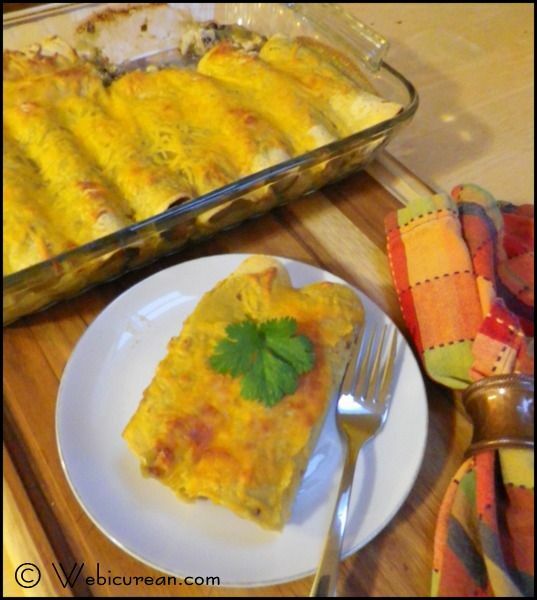 I turn my turkey into enchiladas too – great recipe! 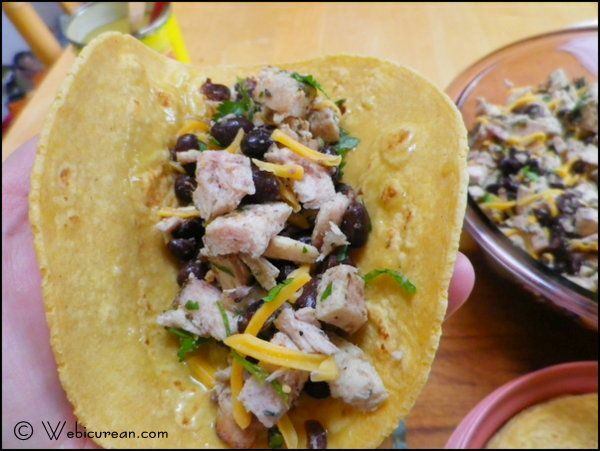 I make this with chicken a lot but never thought to use leftover turkey! Great recipe. Happy Thanksgiving! It was a huge revelation once I started using the turkey! Hope you had a great holiday too! Now THIS is a fabulous way to use up turkey! YUM! Jen @JuanitasCocina recently posted..Sweet Potato Cinnamon Rolls ~ Thanksgiving Leftovers #SundaySupper! Delicious! Thanks for the tip on the tortillas, the ones I buy always seem to fall apart. I had that problem too for the longest time. I’ve tried various ones too, and the only ones that didn’t seem to work were the blue corn tortillas–for some reason they got really pasty! These sound and look awesome! Now I just need the turkey! Muy Bueno! Great way to spice up a post Thanksgiving meal! Perfect twist on what to do with the turkey! By Saturday, you are definitely looking for some new flavor combinations! I love the idea of making enchiladas with leftovers! I definitely have to try this this year! 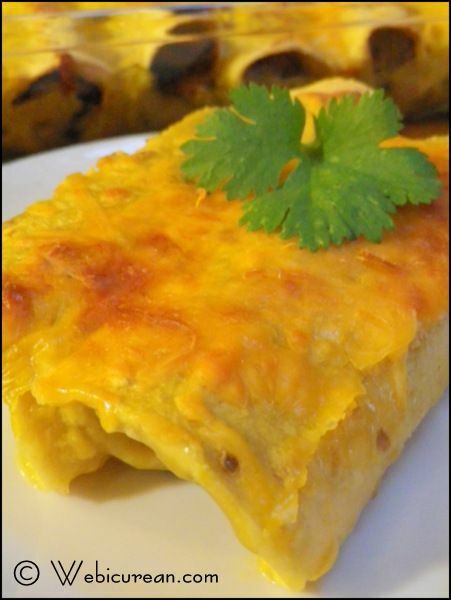 I love enchiladas any time of year…these make leftovers something to look forward to! Happy Thanksgiving! What a great idea! I would have never thought to sub turkey for chicken in my enchiladas! The black beans are awesome too!! Why yes, I am hungry! Thanks to you and this great looking recipe! Mmmm… these look really, really good! What a great way to put the turkey to use! What a great way to use your left overs. Enchiladas are definitely a great idea! My dad loves to make sandwiches with the leftover meat, so I’ll have to point out making enchiladas instead. These look great! I love enchiladas! I will have to make these. Thanks for sharing. Y’know…I always turn to sandwiches, but this is a great idea! So easy! Great idea! I love enchiladas, but have never made them with turkey. Look forward to trying this. This has to be my favorite use of left over turkey. I LOVE enchiladas. Love ’em! This dish looks so good. What a marvelous dish! I remember making ham and turkey enchiladas after Thanksgiving when we were newlyweds…they were good, but yours look SO much better! I’ll squirrel away a little turkey to try this next week! Oooh that sounds good–ham & turkey? Maybe I’ll pick up a slice of breakfast ham to make that happen! Semi-homemade is perfect after all the cooking that Thanksgiving entails, and these look delicious. 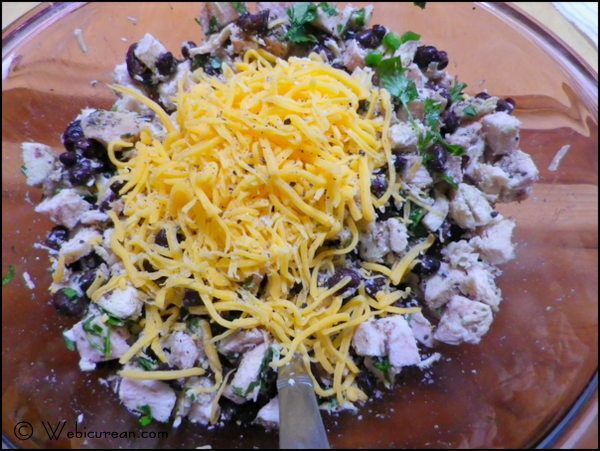 Wow….love those grated cheddar cheese on top! Great recipe! Perfect thing to make after Thanksgiving! Yum! I wanted to stop by to wish you and your family a happy Thanksgiving! Hi Christi! Hope you and your family had a great holiday! Thank you for a great dinner idea! It’s what I just made with our leftover turkey. Oh my goodness! 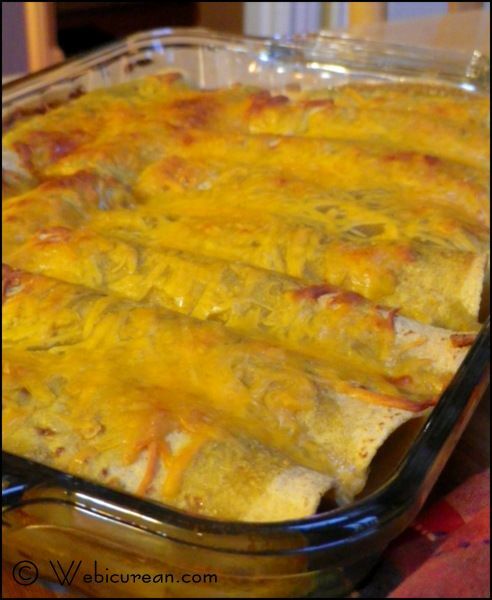 These enchiladas look ridiculously delicious! Thank you for a delectable idea… This is an absolute must-try recipe. Turkey Day Leftovers? #SundaySupper Has You Covered! | Mama.Mommy.Mom. Tomato Florentine Soup and A Special #SundaySupper Birthday! | Mama.Mommy.Mom.